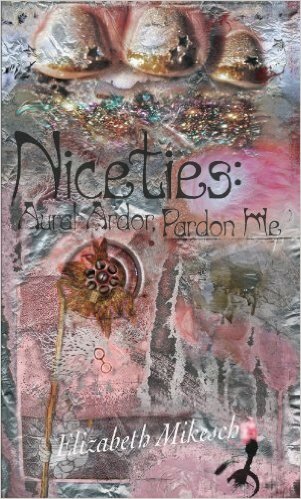 The narrator of Elizabeth Mikesch’s Niceties is not interested in explaining her life to you. She is only sometimes interested in thinning the fog between you and her, providing glimpses here and there of a fanatical grandmother, anonymous lovers, and Finnish pancakes. Mostly we get the record of a fresh mind. Mikesch’s language overwhelms her tales, which is not a complaint. It turns the mundane into the strange and the strange into the sublime. Noy Holland, in her blurb, called this book “witchcraft.” It is full of black magic words. “When We Were French” is about a mother anxious for her pre-teen daughter, and it is crammed with memories of that mother’s sexual past. It opens with a question: “Would we say that we would go a ways to the place of the one who we could never name?” Here two conditionals are followed by a vagueness of destination and an impossibility of naming that destination’s owner. We are already four removes from solid ground, five when you count the interrogative uncertainty. The question is also a “Keep Out” sign to the reader looking for a mainstream collection. To the reader looking for something else, it has a fairy-tale-ish charm. It draws us into the woods. There was a quickness once that we wore upon wired wrists. It hung limp, seam to waist. We crab-crawled not to trip with mixing bowls up on our heads to practice grace. We had high heels that wobbled like sea birds when we strolled. A fresh mind is at play here, but the play is serious, and the fall and rise of fog suggests a pattern of experience. The narrator is always grasping for a solid hand-hold and sensing immediately that one does not exist, or that it will not remain solid for long. The language is of a writer determined to speak in a new way, to describe with an infant’s new wonder of the world. Mikesch, of course, is no infant. Her wonder bends the world darkly. Another strategy can be seen in “Those Who Have Dwelt in My Lilt,” a sideways summation of her love history. The piece has no dramatized scenes. If it had no indentations, some of the paragraphs would look like verse. I mean to embalm ya’ll in swoop-ins. These odes I ooze! Today I introduce myself to you via whoopses. Many asked before they had felled, Are you from somewhere elsewhere. We are pulled (or jerked) from paragraph to paragraph by the “l” sounds all through and the “oo” sounds in the last three. The manner of telling here exceeds by far what is being told. The piece has the suggestive power of poetry. “Felled” in the last line implies a tree-like woman who has succumbed to the bad lines of many lumberjacks. This idea in other hands might have been fleshed out into a long summary of romantic failure in Oregon. Here it has been compressed into a single magic line, bent to an idea of sound rather than development. Lyricism requires constant bending. Its primary goal is to make the bland world beautiful. Marilynne Robinson’s Housekeeping comes immediately to mind: the prose elevates the crashing of a train to a moment of more than terror. Readers feel the awful breaking of steel and flesh, but at the same time they hear calm, contemplative music. That is Robinson’s ordering voice, and it sustains the novel through its end. Robinson’s lyricism suggests a positive commitment to the world. Its objects and events can be described in lucid, luscious words, and it can be made into something greater than we imagined before. Wet TP is like whisper, gets what song ears never hear even when listened to as careful as any girl could. The only lotion I have got is calamine. The only shampoo kills lice, scalps the skull with its ingredients, killing off the bugs that used to live in our hair. We would as kids pick at each other’s little lices like tiny apes even after we ran out of mayonnaise. We wet our sheets and set the lice on fire. We wet the dog and put her in the oven. The paragraph’s logic is linguistic and rhetorical. The bugs in the third sentence hatch memories in the fourth and fifth, while the fire in the fifth leads to the baking dog in the sixth. The return of “wet” ties the opening to the close. The initial metaphor feels plain wrong. The whisper lacks an article. And exactly how are these two things like each other? The narrator does not elaborate upon her observation. She lets it sit in that first position, daring readers to give up or follow along or maybe not daring them at all. She seems indifferent. But the metaphor also conjures a woman on the bathroom floor, dipping toilet paper in a puddle or toilet, then rubbing it to hear its sound. To see her in that position is to know briefly her grim and funny loneliness. The fog has not been lifted but dispersed. The narrator is at last able to say something clear. Yet her words sound almost jarring to us because we have grown so used to her bent syntax and diction. Those lines are a final arranged disruption, lighting the great fear in the book’s heart. In there Mikesch has cooked a strange and not entirely pleasant brew of words. But pay no attention to the eyeballs on the surface. Drink up. Better yet, eat the eyeballs and everything else on offer. We need new flavors to gain new rewards.